Some years ago, I had the opportunity to work with the Darice craft supply company on contributing designs for a line of puppet kits they sold at fabric and craft stores nationwide. 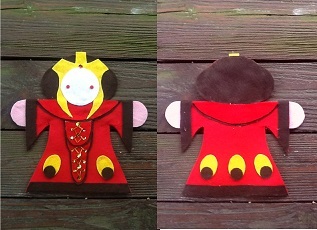 They were inexpensive, easy-to-construct felt puppet kits that came complete with all the supplies and instructions. Those kits have long since been discontinued, but inspired by that, my puppet book, and the unexpected success of my recent puppet workshop at AtomaCon, I am in the process of designing my own line of puppet kits (the working title of which is Puppet Peeps--yes, it's silly, but it's just a working title!). I'm going to start making these available at conventions, workshops, and other events they might be appropriate for--you'll be able to get either just the patterns/instructions (where you purchase your own supplies), or a kit that comes with the supplies as well as the pattern, or even a completed puppet if you wish! Shown here is the first design in the Sci-Fi Puppet Peeps line--there will also be Action/Adventure Puppet Peeps, Fairy Tale Puppet Peeps, and many other genres. Watch for the Ghostbusters coming soon!